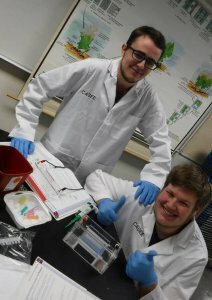 Seniors learn the same biotechnology equipment and techniques that scientists use in research, health care and agriculture. The third set of classes available at CASEE is the CASEE 4 courses- Biotechnology, Microbiology, and English 4. Enrollment in CASEE 4 gives students an exclusive lab experience learning about the world we cannot see but could not live without. 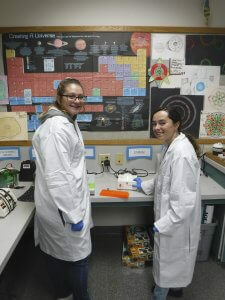 Students conduct experiments involving microbial cultures. DNA & Protein analysis, genetic modification and more gaining skills for a number of career fields. All new students must complete and submit the New Student Application. Returning students submit a separate application. Microbiology is a two semester lab science course covering cell physiology and biological research techniques and genetic engineering. The course will survey the microbial world with its many branches of bacteriology, virology, mycology, parasitology, and others. The sub disciplines of veterinary, environmental, evolutionary, industrial, pharmaceutical, and food microbiology will be studied as well. Biotechnology is hard but CASEE students worker had and take pride in their accomplishments! Agricultural and Industrial Biotechnology is a two semester course which provides entry-level as well as advanced training in biotechnology skills, methods, and applications. The course is laboratory based and integrates the core competencies of the life science career pathway and physical sciences with the technical skills needed for post-secondary education and/or employment in the biotechnology industry. This is a yearlong course that will lead students through the analysis and evaluation of many forms of literature independently, in group discussion and in writing. This literature will include fiction and nonfiction essays and novels, drama, poetry, short stories and current events. Using the context of Biotechnology and Microbiology provides a fascinating framework for the study of cultural, political and religious events around the world over the course of recorded history. The influence of microorganisms on literature is vast due to the central role in many major events, wars, cuisines, tragedies, scientific breakthroughs, and much more. In addition, these fields lend themselves well to works of drama and science fiction, which students will read and respond to prior to creating their own work of literature and performing and filming their own dramas.